Assuming the Bax symphonies will someday receive the popular attention they so obviously deserve, I predict at least three of his seven symphonies will come to be ranked with those of Elgar and Vaughan Williams as the greatest examples of British music in that form. 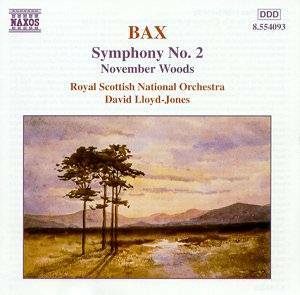 While Bax's Third Symphony was for many years his most popular symphony, its reputation in recent years has suffered (rather unfairly, I think) in comparison with those of the Fifth, Sixth and Second Symphonies which are regarded by most Baxians as his most characteristic and brilliant orchestral works. Surely, one listen through of this new Naxos recording of Bax's Second Symphony with David Lloyd-Jones conducting the Royal Scottish National Orchestra should convince any sympathetic listener of Bax's limitless musical imagination and brilliance at writing for a large symphony orchestra. The Second Symphony is the most deeply personal of Bax's works, which is saying a great deal considering how much of his music is autobiographical. He poured more of himself into this work than any other. Its composition consumed him for the greater part of two years and at its completion, he said he felt physically and emotionally exhausted. Any successful performance of this work must convey the deeply troubled state of mind the composer was going through at the time of its composition. David Lloyd-Jones' performance most certainly succeeds in this regard. From the unbelievably ominous opening with its bass drum roll and sinister motif for cor anglais, clarinet and bassoon through the middle movement's impassioned outbursts for organ and running strings to that most desolate and inconsolable of Bax's famous epilogues, Lloyd-Jones' interpretation is one that emphasizes the dramatic and descriptive elements of the score. His fastidious attention to detail uncovers a wealth of instrumental color and invention. Naxos has provided a very clean but also very dry recording which allows the listener to hear much more of what is going on in the orchestra than could be heard on the Chandos recording with Bryden Thomson. I myself would have welcomed a little more ambient warmth which might have provided more richness to the string tone. The nearly 30-year old recording made by Lyrita with Myer Fredman conducting the London Philharmonic is still the preferred recording in terms of sound. This budget Naxos recording is in almost every way preferable to the Chandos recording. Lloyd-Jones' interpretation is as spacious as Thomson's but he is much more successful in navigating the intricate shifts in tempo and mood and, most importantly, in keeping the music moving. So often with Thomson's Bax the impression is given of the music being pulled out of shape in order to accommodate that conductor's desire to wallow in Bax's gorgeous harmonic textures. Lloyd-Jones is a much more disciplined conductor, and like that greatest of all Baxians, Vernon Handley, his aim is clearly set at giving the music shape and assuring that its structure holds together. Mention should also be made of Fredman's Lyrita account which is currently unavailable. That fiery performance is a classic and nicely compliments this weightier and more broadly conceived performance. Its release is an absolute must but in the meantime I want to wish this new Naxos disc every success because I believe it could make many new friends for Bax and this symphony in particular. I can't think of a more underrated masterpiece in British music. The companion work on this disc is November Woods. The standard recording by which all new versions of this work are judged is Sir Adrian Boult's definitive account on Lyrita with the London Philharmonic Orchestra. Both Neville Marriner and Bryden Thomson give similarly conceived performances which ultimately fail to impress as much as the Boult. Lloyd-Jones, perhaps wisely, approaches this work differently. His is the more literal interpretation of a violent autumn storm with the more introspective elements of this tone poem being underplayed. This is a brilliant, on the edge-of-your-seat performance which I suspect will be controversial but which also goes to show that great music can be played in more than one way. The playing by the Royal Scottish National Orchestra is both works is sensitive and virtuosic. I now look forward to Lloyd-Jones' recording of the beautiful Third Symphony which is scheduled for release later this year.